We’re floored by painter and engineer [Bob Partington’s] graffiti briefcase, which proves how well art and tech can complement one another. Fear not, Arduino haters, [Bob]’s case is an analog dream: no microcontrollers here. The guts consist of 2 components: a linear drive system and a trigger assembly. The former takes advantage of a small RC motor with a chain drive which slides the can’s mounting unit along two stainless steel rods. The latter includes a custom wound solenoid plugged into a 24V cordless drill battery, which slams down 5 pounds of force onto the can’s nozzle to fire the paint. This all fits into an otherwise inconspicuous looking briefcase to provide some urban camouflage. The final component is a stencil, which slides into a rectangular hole on the bottom of the case. The paint can sprays downward through the stencil and tags the ground at the touch of a brass button located near the handle. [Bob] has plenty of other cool inventions you should check out that are less illegal. Or, stick it to the man by automating your tagging with Time Writer. It turns out he was right. He put me in contact with [Randy Sargent], the founder of FindChips.com. If you’ve ever hacked together a script to make your life easier you’ll want to listen to what Randy had to say. You never know when it’ll turn into a full-blown start-up. Consider a book sitting on a shelf. You can lend it out to a friend, you don’t need a special device to read it, and if you are so inclined, you can photocopy it. This isn’t true with Kindle eBooks that place severe restrictions on what you can do with a book via DRM. Although it is possible to strip eBook DRM with a few programs on your computer, [Peter] came up with a fool-proof way that’s an amateur engineering marvel. 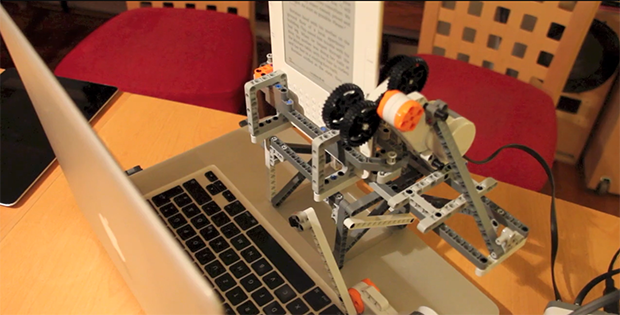 He’s turning Kindle eBooks into plain text using Lego. [Peter] is using a few bits of a Lego NTX system to press the, ‘next page’ button on his Kindle, then smash the space bar on his Mac to take a picture. These pictures are then sent to a cloud-based text recognition service. After a few hours of listening to plastic gears grinding, [Peter] has a copy of his eBook in plain text format sitting in his computer. As impractical as it looks, using a robot, camera, and OCR is actually a really, really good way to turn eBooks plagued with DRM into a text file. Even if Amazon updates their DRM to make the current software cracking methods break, [Peter] will always have his Lego robot ready to scan a few hundred pages of text at a time. This display is easily recognizable by the buttons and the outline of a vehicle to the left. It’s a Vehicle Information Center (VIC) from a Jeep Grand Cherokee. [Florlayamp] discovered a row of the vehicles in a junkyard, all with the displays still intact. He grabbed one and turned the VIC into a desk clock. What would you pay for such a fine piece of used electronic hardware? How about six bucks? Yeah! Getting it running couldn’t be simpler. It’s all set up to be programmed and run on it’s own. A bit of searching around turned up a schematic to figure out which wires are for power. It took some time to figure it out, but the thing draws about 2A so finding a worthy wall wart was a must. Now that he was sure it would work [Florlayamp] started on the case build. It’s poplar with quarter round to frame the display. On the back you’ll find a single rocker switch. Usually we see the opposite of this, adding displays to the dashboard instead of salvaging them. With the combination of small, powerful, and pocketable computers and cheap, off-the-shelf software defined radio receivers, it was only a matter of time before someone built a homebrew spectrum analyzer with these ingredients. This great build is the project of [Stephen Ong] and he’s even released all the softwares for you to build this on your own. The two main components of this build are a BeagleBone Black and its 7″ Touchscreen cape. The BeagleBone is running Angstrom Linux, a blazingly fast Linux distro for small embedded devices. The radio hardware consists of only a USB TV tuner supported by RTL-SDR. In his demo video, [Stephen] shows off his project and by all accounts it is remarkable, with a UI better than most desktop-oriented SDR software suites. You can grab the BeagleBone image [Stephen] is using over on his blog, but for more enterprising reader, he’s also put up the source of his ViewRF software up on GitHub. We know that armor making is an art form. We know it. Still… it’s really easy to let yourself think that making a chain mail shirt is easy after seeing the skills [KdogCrusader] throws down in this build. His hauberk isn’t quite finished yet, though we don’t blame him from wanting to show off the work having put so much into it. The process starts with fifty pounds of stainless steel wire. That’s the coil suspended on a rod in the upper left. It’s fed into his hacked together coiling jig where it is wound into coils that set the diameter of the rings (think long springs that aren’t springy). Coils are cut along one side resulting in that mountain of individual rings. From there it’s a matter of interlinking all of the rings. He cut apart an old T-shirt to use as a pattern during the assembly. So far the front and the back are only connected at the shoulders as he has yet to add sleeves and finish the sides.